NEWS REPORT: The defending champions and remaining participants of the Women's EHF Champions League Group Matches have learned their fate in the initial group stage of the new season. 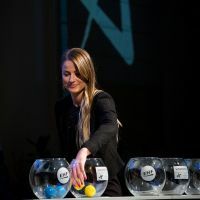 The Women's EHF Champions League teams have learned their travel itinerary in the group matches of the upcoming season following the draw event in the Vienna city centre. The defending champions Buducnost have been drawn into Group D together with the Romanian newcomers CSM Bucuresti, Sweden's IK Sävehof and MKS Selgros Lublin from Poland. Jean Brihault, EHF President, Michael Wiederer, EHF Secretary General carried out the draw in cooperation with Buducnost right wing Radmila Petrovic. The first round of the group matches is scheduled for 16-18 October 2015. The top three teams in each group will qualify to the main round, while the bottom teams will carry on in the Cup Winners' Cup. Predrag Boskovic from Buducnost said: "There are no weak opponents in the group matches. For us it is really important to prepare well and as our players said we need to believe in ourselves. That's the most important. Opponents come as they come." FC Midtjylland's manager Torben Kolbaek commented the draw: "It could not be any worse. There are three teams from the 2014 FINAL4 in this group (providing that Györ qualify). If that is not a dynamite group, I do not know what a dynamite group is." The playing dates overview and the playing system can be found here.